The OHS policy body published a revision of the model Code of Practice, Managing the Risk of Falls at Workplaces (“Code”) in March. The revised Code stipulates that ladders meet the requirements of AS 1657, which was also recently updated. Changes to the Code and the Australian Standard are timely, given that ladders are the number one cause of fatalities due to falls from height. The changes make sense because the way people use ladders is taken into account. The entry gate to an inclined fixed rung ladder fitted with a cage, for example, is now located away from the ladder. This means workers do not have to stand on the ladder while opening the gate. Instead, the Code specifies a landing space where workers can stand comfortably before releasing their three points of attachment. Exploratory research by prominent ergonomist Professor David Caple revealed the transition between rung ladders and a landing deserves special attention. The design of treads and rungs also influenced the likelihood of injury. The Professor explained the spacings, radius or width and even the distance from the wall, of rungs were all important. “If the stiles and or the treads on the vertical ladder are too close to the wall, it increases the potential for someone to fall because they haven’t got good stable support of their foot to stabilise their centre of gravity over the tread,” Professor Caple said. The revised AS 1657 says the spacing between the bottom rung and the landing needs to match the spacings of the remaining rungs. The Caple study found a lack of uniformity presented an extra hazard to ladder users. “Because they (ladder users) couldn’t see the treads on a vertical ladder as they were going down – they tended to, when they got to that bottom tread, either look down and then take a more careful step onto ground level or they might stumble and miss it completely,” Professor Caple said. Step ladders are better than rung ladders because their wider, flat treads offer better support for users and Professor Caple found that rounded rungs affect the user’s centre of gravity. People climbing rounded rungs in the Caple study tended to place their feet on the front edge of the rung, shifting their centres of gravity further back. The outcome was that a rounder rung placed greater biomechanical loads on their hands and arms as they climbed the ladder. Better still than step-type ladders are stairways, as recommended in the new AS 1657. The standard’s hierarchical approach steers readers to safer options like stairways because users have a more upright posture while climbing up and down. A more upright stance shifts the effort from the upper body to the more powerful legs, relieving the arms and shoulders. Apart from making it easier and safer to carry tools, this also means less fatigue and a lower risk of falling. The Code offers practical guidance to reduce or eliminate the risk of falls. Workplaces that adopt the code methodology are deemed to have met their requirements under the regulations. Australian Standard AS 1657 (Ladders, platforms, walkways, guardrailing) is referenced in the Code. Deviating from them would need to be justified if an incident was examined in court. Document reasons for any deviation in a risk assessment, reviewing the likelihood and consequence of a fall, while comparing the cost of safe and compliant control measures versus the cost of injury. Standards are undated in codes of practice, ensuring that revisions to standards are always referenced. This is particularly relevant to AS 1657, which was revised in 2013. 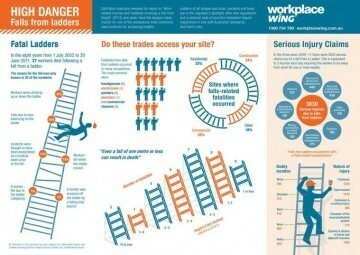 Falls from ladders are the number one cause of workplace deaths due to falls from height in Australia. Following the model Code of Practice, Managing the Risk of Falls at Workplaces, together with AS 1657 goes a long way towards saving lives. Together, they spell out sensible height safety rules that make it clear how workplaces can increase the safety of workers at the lowest possible cost while minimising legal liability.